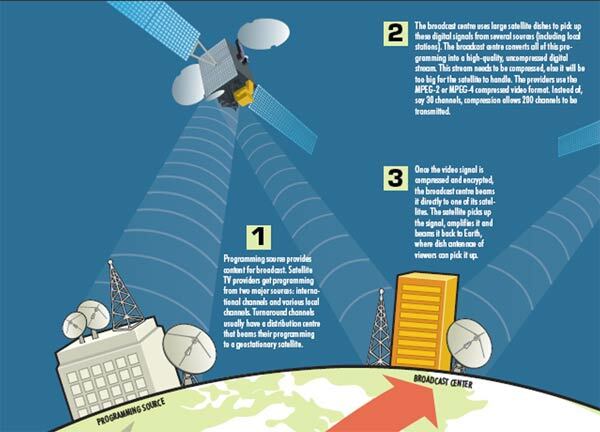 In direct-to-home (DTH) telecast, TV channels/programmes are directly distributed via satellite to the subscribers' homes without the content going through a cable operator. The signals are transmitted in Ku band (10.7 GHz to 18 GHz) and are received by the subscribers through a small dish antenna and a set-top box. The DTH system can also provide many value-added services such as the Internet, e-mail, data casting, e-commerce, and interactive multimedia. Satellite TV solves the problems of range and distortion by transmitting broadcast signals from satellites orbiting the Earth. Since satellites are high in the sky, the larger line of sight can accommodate a lot more customers. DTH transmits and receives radio signals using specialised antennas called satellite dishes. The first movers in India were Dish TV and Tata Sky, followed then by Sun, Big TV, Airtel Digital, Videocon, etc.